In the hall closet, under the beds, on the bookshelves are all spots that we have games stacked and shoved. The only thing better than playing a game or two is adding something new to the stash. Recently we added two new games, Tapple: Fast Word Fun for Everyone and Wonky: The Crazy Cubes Card Game, to our game collection. USAopoly kindly allowed us to review these family friendly games and I am excited to share them with you. You can learn more about USAopoly at their About page. Take a moment to watch the Our Company Story Video. Tapple is designed for 2-8 players/Ages 8 and up. Game play takes about 10-20 minutes. Allow extra time for laughter. Tapple – Fast Word Fun for Everyone! Do you enjoy word games? Can you think fast? Like to laugh? Yes? Well, let me tell you about Tapple. The simplicity of this game is what really makes it shine. A small deck of Category cards that are double sided provide for plenty of play. Some of our favorite categories are: Historical Figures, Cities, and Fictional Characters. The Tapple wheel (two AA batteries are needed) has 20 letters and a 10 second timer in the middle. That is all you need for a quick, fun game with the family. Game play is easy! Here’s a quick video to show how it’s done. Creative thinking can be the key to winning those challenging categories. With this fast paced game, it isn’t what you know but how fast you can recall what you know. Tapple has provided much laughter around our table. My kiddos ages 9 and up have enjoyed playing a quick game in the afternoons. It provides a great “brain break” after a day of studying. It has been interesting to see who is better at quick thinking or perhaps thinking outside the box. The oldest does not always take the easy win. Tapple could be easily adapted to allow younger ones to play. Simple turn the timer off so the pressure of “beating the clock” is gone or perhaps give them two timer rounds to give an answer. You can also come up with your own categories that are easier for younger players or work in teams. With a large family finding games that allow for a large group to play can be challenging. I love that Tapple not only allowed up to eight players but that I could flex it a bit for my younger ones as well. Wonky is designed for 2 or more players/ 8 year of age and up. This game is great for large families. 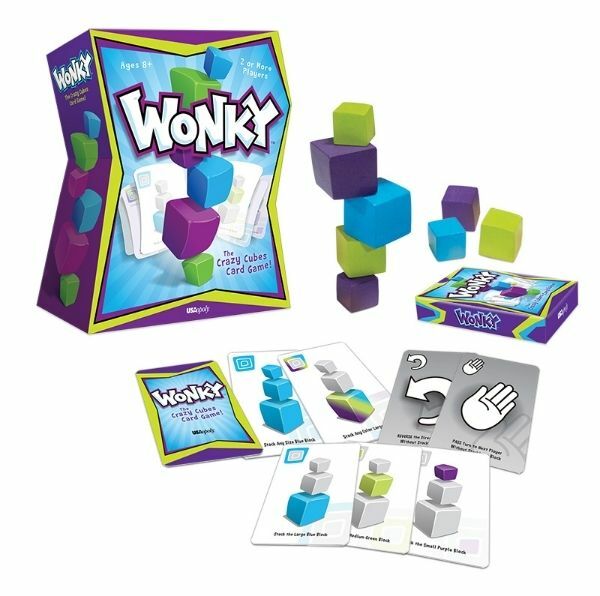 Wonky: The Crazy Cubes Card Game – This game has been a huge hit in our home. Who knew that stacking wooden blocks would be engaging, frustrating, and hilarious all at the same time? USAopoly has created another game that is genius in its simplicity. Stacking the blocks in Wonky is challenging because not only are there three sized cubes, the sides are not even and flat. All of the cubes have curved sides. This can quickly throw towers off balance. While you definitely need cube stacking skills, the essence of this games comes down to strategy. You really have to know how to play your cards so that you use your cards up first. Of course with a game like Wonky choosing where you play the game is almost as crucial as strategy. Especially if you have a 15 month old in the house. Ezra, our resident block tower demolition master, found the colorful cubes of Wonky too much to resist. He was more than happy to bring the towers crashing down. Perhaps USAopoly should put a warning on the box if playing near a toddler. We have loved playing Wonky. This is a game that doesn’t limit the number of players. You just adjust the number of cards dealt according to the number of players. Perfect for the large family game night! While game play is for ages 8 and up, my three, five, and seven year olds love playing Wonky. It is stacking blocks, right? Preschoolers are masters of the blocks! Naturally, they do not have the strategic skills to use the cards to their advantage. But the cards are very easy to understand so even the three year old knows which blocks to play. She doesn’t really care if she wins or not. She is just happy to be playing with the big kids. 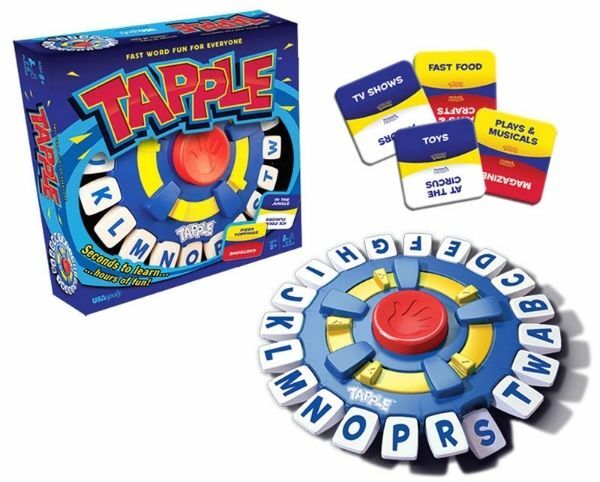 Tapple and Wonky have added fun and laughter to our afternoons and family game nights. We are still waiting to see who will be the one to master stacking all the Wonky blocks. A competitive spirit may run strong in the Tribe. These game would be great to add to your family’s stash of games. Perfect for a birthday gift or the holiday season. But don’t just take my game loving family’s word for it. See what other Crew members thought about Tapple and Wonky! Don’t forget to check out other games from USAopoly! This entry was posted in Homeschool, Something to Share, TOS Crew Reviews and tagged family, fellowship, games, laughter by sweetie. Bookmark the permalink.